The Brookmeadow Park subdivision in Livermore is a good place to buy an investment property in Livermore. It is sandwiched between Autumn Valley and Windmill Springs next to Patterson Pass and N. Mines Road. Brookmeadow Park homes vary greatly in size because they are comprised of basically three builds. There are condominiums, smaller traditional and mid sized up to about 2000 sq ft built by McBail in the late eighties, so Brookmeadow Park investment property can be found in three price ranges. The larger homes are on Erica, Andrea and Mulqueeney. So, if you are looking for a good investment property, you can start in Brookmeadow Park. There are price ranges that can make sense for many investors, and the rents are strong. Exisiting homeowners there can always enjoy home value appreciation even if there are a number of rental properties around. Depreciation really only happens when a subdivision of single family homes and condos are surrounded by high density apartments. This is not the case in Brookmeadow Park. 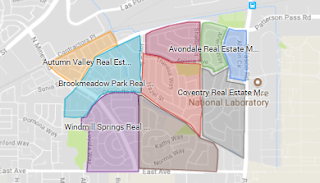 The Arroyo Secco, "dry stream" in Spanish, is an important Livermore watershed that winds through the subdivision, and it provides space between abutting lots of land where no one can build. There is also an electrical easement there that abuts the tract. Huge lots are created because of the easement that abut the tract, so it looks like a football field in the back yard. There is a large pool off of Marie Common and four tennis courts off of Kimberley Common. All in all, The Brookmeadow Park subdivision is a good place for starting investors as well as the seasoned portfolio holders. Mini Pumpkins--All 635 of Them!